This is useful parental advice for if your child uses TikTok. This NSPCC animation explores simple steps we can all take to make children safer. 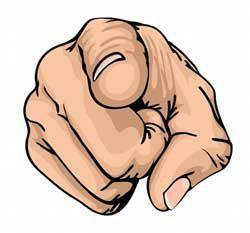 Parents play an important role in keeping their children safe online as well as in the real world. Here are some resources to help parents to gain the necessary skills to deal with safety in an online environment for both themselves and their families. 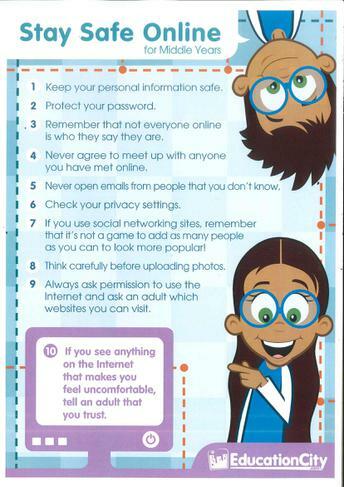 Minterne CJ School believes that online safety (e-Safety) is an essential element of safeguarding children and adults in the digital world, when using technology such as computers, mobile phones or games consoles. The internet and information communication technologies are an important part of everyday life so children must be supported to be able to learn how to develop strategies to manage and respond to risk so they can be empowered to build resilience online. Youtube's minimum access age is 13 years old. However, parents can supervise and monitor their children, and put in safety measures, to help younger children use this fantastic tool safely. What happens if my child wants to subscribe to channels on Youtube? Gaming devices provide a variety of interesting activities and ways for young people to engage with their friends and families. However, it is important to be aware of what these devices can do and how you can talk with your child to help them to use this technology in safe and positive way. 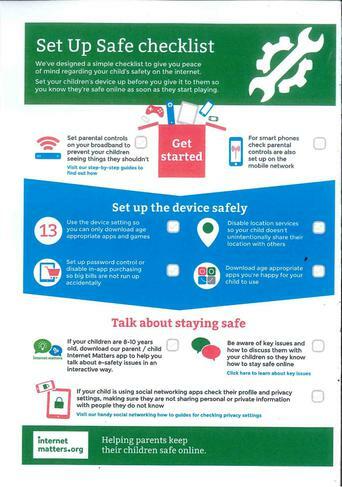 The NSPCC offer free advice for parents about keeping your children safe whilst gaming online. These are the 3 steps to help you get started. 1. Understand the capabilities of gaming devices and how you as a parent can support your child to be smart and safe in their gaming. To help, read the FAQs below. If you are buying a gaming device, why not print our Shopper’s Checklist and ask these questions in the shop? 2. Find out about the parental controls available - it helps if you are the one to set up the gaming device so you are in control of these. Gaming devices have parental controls to help parents manage their children’s gaming, for example, to prevent internet browsing or restrict access to age-restricted games (see our tips for Nintendo, Xbox or PlayStation 4 and Playstation 3 devices). Find out about PEGI age ratings to help you decide which games are appropriate for your child’s age. 3. Talk with your child about safe and responsible gaming and agree a set of family rules. Perhaps you could agree rules with your child about how long they are allowed to play for, how they should behave towards other gamers and agree rules about not meeting up with people they have only met online. See our Family Agreement for more ideas. Remember that gaming devices like the Xbox 360, Wii and PSP connect to the internet, so the same advice and rules for keeping safe online apply.